Dr. Zinon Zinonos received the diploma in Computer Engineering from the Computer Engineering and Informatics Department (CEID) of the University of Patras, Greece, in 2005, and the M.Sc and Ph.D degrees from Computer Science Department, University of Cyprus, in 2008 and 2013, respectively, all in computer science. 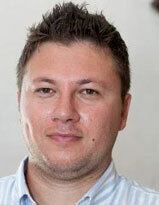 In past years, he has served as as a Post-Doctoral researcher at KIOS Center of Intelligent Systems and Networks and a Visiting Lecturer at Neapolis University. He has served as reviewer for scientific journals in the area of Internet of Things, Sensor Networks, Wireless, AdHoc and Mobile Networks and Mobile Computing. He has published articles to journals and presented his work at several conferences organized by the computer science and communication networks community.